A matrilineal way-of-life is one in which women and men are equal and share power equally, often in different spheres. Women pass on the lineage, name and clan to their children and are in charge of the all things having to do with the earth including agriculture and wildcrafting. Men represent the tribe to the external world. You can imagine how Europeans were confused by this when it came to land use and treaties with native American chiefs. Three women who have been interacting with or living inside a matrilineal culture will be presenting the program for their audience’s consideration: Sally Roesch Wagner of Syracuse, Ronnie Reitter of Victor and Destiny Kinal of Waverly, NY. 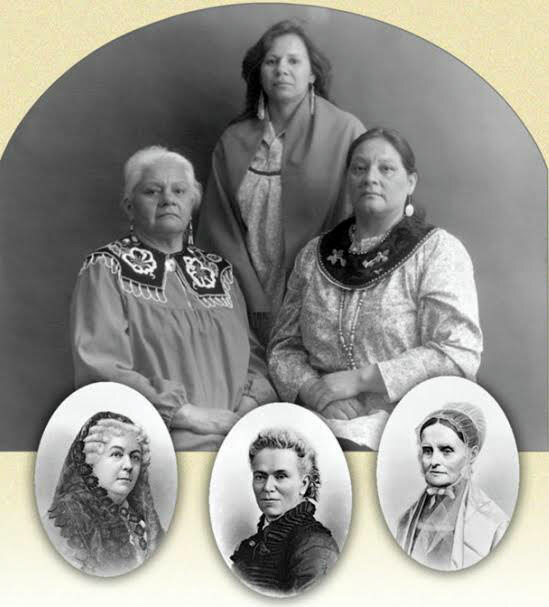 Sally Roesch Wagner’s book, Sisters in Spirit, documents the influence Haudenosaunee way-of-life had on our early women’s rights foremothers—Gage, Anthony and Stanton. 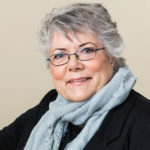 Roesch Wagner’s book is largely responsible for a growing awareness of the international women’s movement’s debt to the Haudenosaunee/Iroquois women. 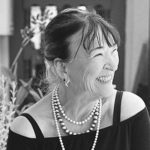 A professor at Syracuse University and Founder/Executive Director of the Matilda Joslyn Gage Center in Fayetteville NY, Roesch Wagner will be introducing a new suffrage anthology to be published by Penguin Classics in February 2019, foreward by Gloria Steinem. Sally will be joined by Ronnie Reitter (photo at right), a Seneca seamstress, cornhusk doll maker and storyteller who recently retired from Ganondagan, the cultural center in Victor, NY that interprets the traditional way-of-life for young native people and for visitors from European, African and Asian lineages who consider themselves allies or are learning about this native American way-of-life. 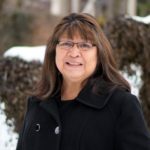 Reitter worked at Rochester Museum and Science Center for 4 years before being recruited to be Peter Jemison’s assistant at Ganondagan for the past 17 years. Reitter will comment on what matrilineality looks like from the inside and speak about the stresses the outside world puts on the tradition. Destiny Kinal will facilitate the conversation. Author of the Textile Trilogy, a series of novels that examines daily life in the 19th century here in the east, places Roesch Wagner’s findings in novel form on-the-ground. As two families—one native, based loosely on the Montour family and one French Huguenot silkmakers—begin to operate as one family metis, tensions between their values and practices begin to test them. While the first books Burning Silk (2010) and Linen Shroud (October 2017) are released, the Textile Trilogy will conclude with Oil & Water, set on the planet’s first oil fields in Western New York/Pennsylvania. A reception will be hosted immediately following the event at Soul Full Cup, 81 West Market Street, Corning, NY. The Rockwell conversation with the three women will continue informally and refreshments will be served. Everyone is welcome. Books can be purchased and signed and a selection of Ronnie Reitter’s hand crafted pieces and cornhusk dolls can be seen on display. The books will continue to be sold at Card Carrying Books at 15 East Market Street in Corning, as well as Riverow Bookstore in Owego and other bookstores in Ithaca. *The Rockwell Museum, a Smithsonian Affiliate, presents Bare Bones Café – a community-sourced museum experience. 2018 marks the 125th birthday of the Museum’s home, Old City Hall in Corning. To celebrate, artists and performers from the greater Corning community have been invited to use an empty gallery as their laboratory and creative gathering place, April 27 – May 12, 2018. At the heart of this pop-up gallery is a challenge – how can an artist present their vision with only bare bones staging? The Rockwell provides the space and limited equipment – the artist brings the space to life. Bare Bones Café is a museum experience included with regular admission prices and open to any visitors of the Museum. A short-term “bare bones” membership may be purchased for those wishing to attend throughout the entire program. Coffee, tea, and refreshments will be available to guests as part of the experience. Find the full schedule of events at rockwellmuseum.org/bare-bones. Housed in The Rockwell’s permanent collection is a new gallery dedicated to Haudenosaunee (Iroquois) art and culture. Haudenosaunee, which translates to The People of the Longhouse, refers to the six Nations of the Iroquois Confederacy—Seneca, Cayuga, Onondaga, Oneida, Tuscarora, and Mohawk. This gallery at The Rockwell features a blend of art and objects of material culture of many different Nations, from pre-contact tools to 19th-century clothes, toys, dolls, baskets and bowls, as well as contemporary fine art by artists including Shelley Niro, Peter Jemison and Richard Glazer-Danay. For more information about this stunning exhibit visit The Rockwell Museum website.